1. Avocados. I love avocados, so I take care to avoid the duff ones. You know the ones I mean: they feel nice and soft, but turn out to be bruised and manky on the inside. 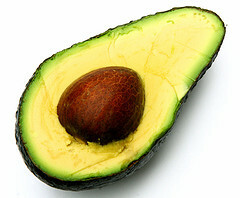 Take your soft avocado in hand and twiddle the stem (or what is left of it): if the stem comes away, the avocado is ripe. If it doesn’t budge, the avocado is probably spoiled. 2. Muddy potatoes. Don’t run away: what’s the big deal? You’re going to be washing and peeling them anyway, aren’t you? Muddy spuds cost up to a third less and what’s more, they last up to three weeks longer than washed potatoes because the soil blocks out the light and helps keep them cool. 3. The freezer aisle! Supermarkets always put the fruit & veg aisle by the entrance, but don’t begin your shop there. Pound for pound, it’s an expensive aisle. When I shop, I walk straight through and head for the freezer aisle in the store’s far corner. I stock up on all the veg I can there: for the most part it’s much cheaper, lasts longer and due to quick freezing, the produce is actually fresher. Example: in the fruit and veg aisle at Sainsburys, fine green beans cost £1.50 for a 200g packet. In the freezer aisle at Sainsburys, green beans cost £1 for a 1 kg bag. You do the maths! 4. Defrosting. If you buy frozen fruit, such as raspberries and blackberries for crumbles or fruit salad, empty them into a colander and rinse them under a cold tap before you leave them to defrost. This will help them to thaw without turning to mush. 5. Apples. Buy the kiddy bags. You know the ones I mean: the packaging is daubed with cartoon lunchbox stuff, the apples are slightly smaller and you get more of them to a bag. They are just as nice as “normal” apples, more flavoursome than “value” apples and they work out cheaper. 6. Keep fruit & veg from going mouldy. An oldie but a goodie: a well-placed sponge should do the trick! See this post about keeping salad drawer items fresh for the lowdown on this trick. Good tips! We just recently discovered the magic of frozen fruit and veggies! Thanks for the tip about defrosting. When we try to use the frozen fruit for something other than a smoothie, we run into trouble! Great tips. I definitely learned something new when it comes to picking my fruit and veggies. I typically do not buy frozen veggies, but given some of the cost difference you’re talking about, I will definitely consider it. Just been to tesco and got 4 bags of lovely jkt spuds for 14p each, two heads of broccolli for 12p each and a bag of spinich for 30p, soup on the go as we speak! On a seperate note, if you cant find jars big enough or cheap enough to do pickled onions etc, nip to your local chippy and ask them to keep their pickled onion/eggs/gerkin jars for you. They are free, you will be helping the environment, and the lids are already coated!